Depth classification: deep partial thickness: Dermal layers involved****? Wound characteristics? Healing? (Focus on layers involved) Epidermis+ all of dermis. Character: red waxy white, reduced pain, reduced pain sensation. Heal: 2-3wk, sx intervention recc to prevent scar. Heal: requires Sx for healing. 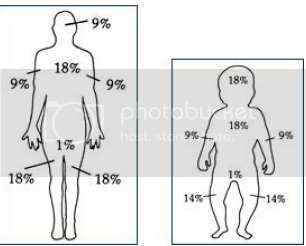 Rough estimate of how much total body surface area is affected by a burn is determined by... 1 of these charts. Extrapolated from ppl so not super accurate. Trunk is how much of TBSA? About 18%. (3) Zone of hyperemia: viable cells, local inflammation. Clinical appearance of superficial burn? May not show up at all, might just be hypersensitive. Clinical appearance of partial & full thickness burns? Readily apparent after injury, Thick leathery surface of dead tissue=eschar. When does the hyperdynamic/hypermetabolic phase start in relation to a severe burn injury, how long does it last? How would you describe it? See 3-5d after a SBI, & you can see the associated increased metabolic rate for up to 24 MOS after the injury. The hypermetabolic phase is characterized by protein catabolism, gluconeogenesis, glycogenolysis, lipolysis (think hormones like glucagon & HSL). There is also REDUCED vascular permeability, inc HR, dec vascular resistance, & inc CO. When eval PTx, what should you be looking for/concerned about in terms of the ocular system? Immediate & subsequent swelling may prohibit ocular exam. Look out for exposure keratopathy, Corneal ulceration, RARELY corneal burns - IRRIGATE EYES LIBERALLY. What w/ electricity will cz more damage? Higher voltage = more damage. Which cardio probs are common w/ electrical injury? ****Arrhythmias (ESP VENTRICULAR ARRHYTHMIAS), Vfib (common cz of sudden death), v-tach, sinus tach. When do you use a defibrillator? Only D-fib for V-fib. If there is V-tach, how treat? LIDOCAINE!! Explain neurogenic (non-cardiogenic) pulmonary edema & its relation to electrical injury Happens bc elec can cz MASSIVE sympathetic outflow → vasoconstriction → hypertension → vessels leak & burst.